I don’t know how many times I have been speaking with friends or family, and they have asked me “What do you do at work?” My response usually goes something like this, “I do Digital Marketing. You know, managing social media accounts, advertising, and SEO?” After I tell them, someone always asks me, what is SEO? After explaining it, their mind is BLOWN that my job is to play games with search engine organic results and WIN!!! SEO is a tricky field, how is it possible to beat a machine in a technology world? Let me tell you, it has everything to do with never giving up and doing continuous research and has nothing to do with memorization and “one-size fits all” methodology. In my time doing Digital Marketing, I have found some amazing tools that aid in website optimization and increased organic rankings, and I am here to share some of them with you. For the next few weeks, I will be sharing tools that I use daily for our websites and client’s websites to increase search engine organic results. I promise, once you understand SEO, you will never look at Google results the same. What is on-page optimization? It is providing a phenomenal user experience, your website content is on point, title tags and meta descriptions are optimized for search engine results, easy to read and keyword optimized URL structure, making sure keywords are in header tags and throughout content (allowing your content to be on point), adding alt text to all media, internal link building, and apply a ‘call to action’ throughout the website. What is technical SEO? This includes checking canonical tags, making sure site speed is equal to the attention span of the average user (which, if you didn’t know is just about 3 seconds), fixing redirect issues, correcting 404 errors, indicating whether you want search engines to follow a page and its links, making sure your website is secure with SSL (http vs https), XML sitemap optimization, and mobile compliance (because let’s be honest with ourselves, we do most searches on our cell phones). Might I add, on-going maintenance in SEO is vital for success. Now that we have briefed the avenues of SEO, let’s talk about THE BIG MAN ON CAMPUS, the Superman of SEO tools, the king of the castle……Moz!!! This tool has so much to offer and their customer service deserves the gold star of excellence! The importance of technical SEO cannot be stressed! Moz crawls your site weekly and breaks down issues it sees. This is a powerful way to really get to know where to start with technical SEO. Each category breaks down the issues and gives you reasons and advice on how to fix them. If you ask me, the most important thing to fix is ‘critical crawler issues.’ These are 404 errors that are found on your website. These errors are proof to search engines that your website is not organized, allowing your competitors to rank above you. Same things go with redirects. Search engines don’t like riding a merry-go-round just to check out the things on your website. Come on people, we live in the 21st century and we are all impatient, even Google’s AI machine that crawls your website. Moz doesn’t stop there with its handy features. 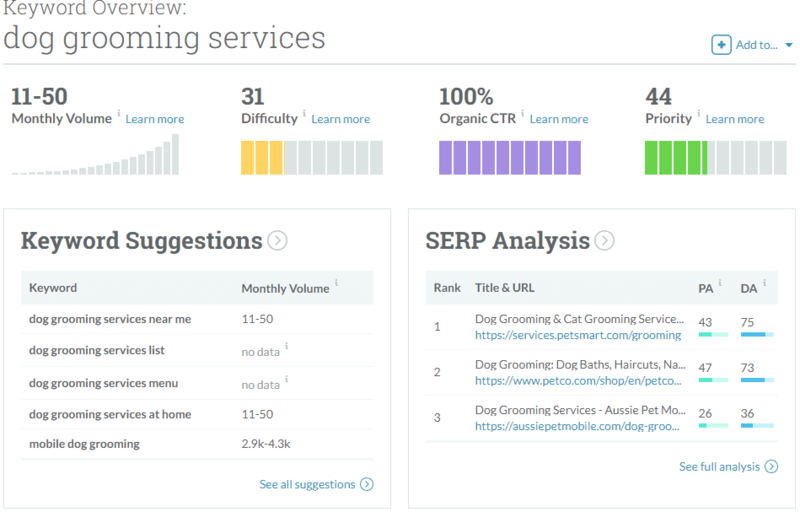 If you check out Moz Pro, their keyword explorer lets you analyze keywords and phrase, give you suggestions on alternative words/phrases, shows you’re the SERP (search engine results page) analysis and rankings for volume, difficulty score, organic click-thru-rate, and priority. Talk about some powerful information. I am so glad you were wondering. It is VERY difficult to find success in SEO with highly competitive keywords (i.e. black shirt, home loan, debt consolidation.) Even though these keywords fit within your business, the research you perform will help narrow down similar, yet effective, keywords that are searched but are less competitive than generic keywords. I don’t know about you, but when I consider keywords, I do not want them to be highly competitive or have a low CTR. 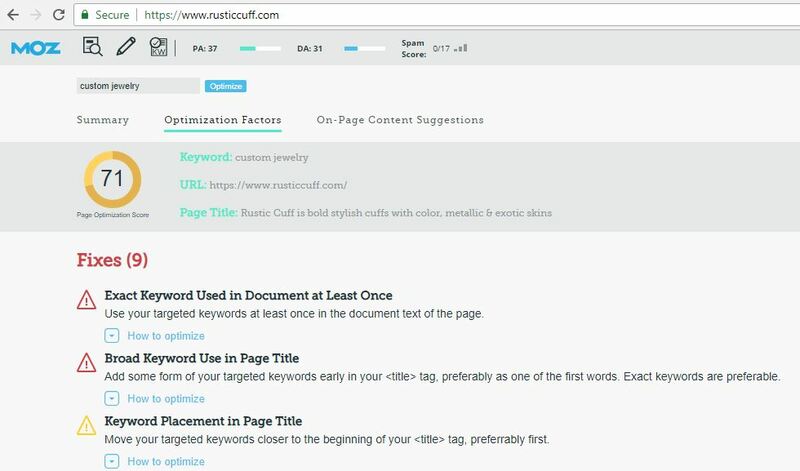 Moz makes the keyword results easy to understand for the ones who are just starting SEO. Moz also has this killer tool where you can analyze your website and your competitors’ website to determine what keywords their website is ranking for, the domain authority and page authority. To be effective in your SEO strategy, you must know what your competitors are doing. If you are a Chrome user, you MUST download the Moz Bar add-on. This allows you to go to ANY competitors website and view they header tags, metadata, link metrics, security status, and a few other great features. 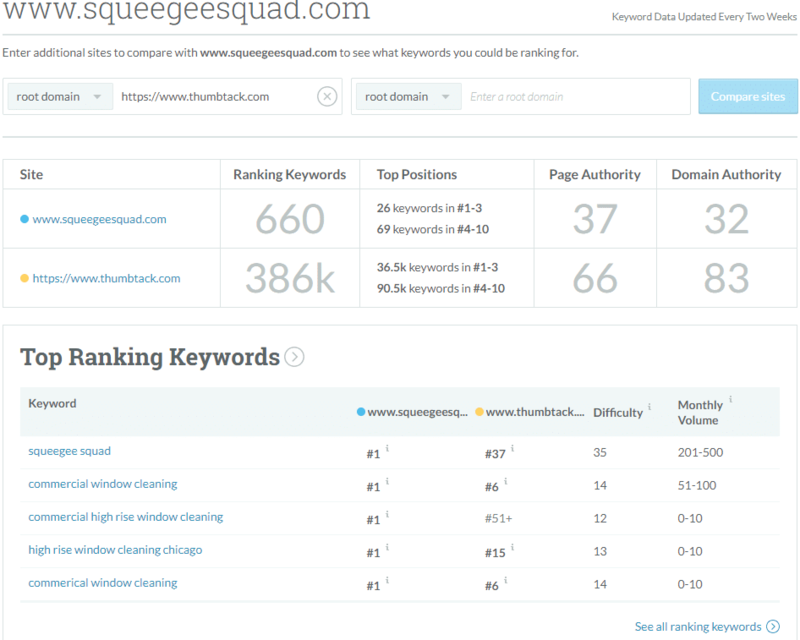 You can even do a keyword analysis against the competitor’s page to see if your keywords are going to compete with their page or give you suggestions to fix on your page to help optimize for that keyword. Tools like this remind me of those kids in school that would write test answers on their hands to make sure they got the answer right, but in this case, the answer won’t get smudged away, because you can return to it again and again and again. I have only introduced a few Moz tools that can help your SEO game. To see them all, dive in and check it out! At Momentum3 Growth, we are all about not only working for our clients to increase organic rankings but TEACHING our clients strategies they can use to increase traffic, do research and learn why SEO is so effective in increasing business. We understand all the hustle and bustle it takes to manage a business and it can be difficult to fit this into your daily operation. If you are not the DIY type, that is okay, because Momentum3 Growth is happy to take the reins and grow your companies digital footprint. Are you unsure how optimized your website is? No problem! We will run a free website analysis for you!